Computer music has come a long way from the days where sounds were recorded on racks of tape and optical discs triggered from a keyboard. We went from there to the age of the digital sampler where small amounts of audio data were stored on floppy discs and computer memory was a rare and costly commodity. Today we are blessed with seemingly unlimited disc storage into the terabytes and computer memory is such that having upwards of 16 and 32 gigabytes is more of the norm rather than an impossibility. This means more storage space is available to store more and longer sound samples allowing us to create more realistic and expressive instruments; but things are starting to shift into an almost forgotten but very powerful and exciting direction. The same technology that allowed us to have more affordable computer memory and storage also brought along with it faster and more powerful computer processors opening the door to the brave new world of “physical modelling”. Those of you who know me are aware of my enthusiasm for physical modelling especially when it come to pianos. 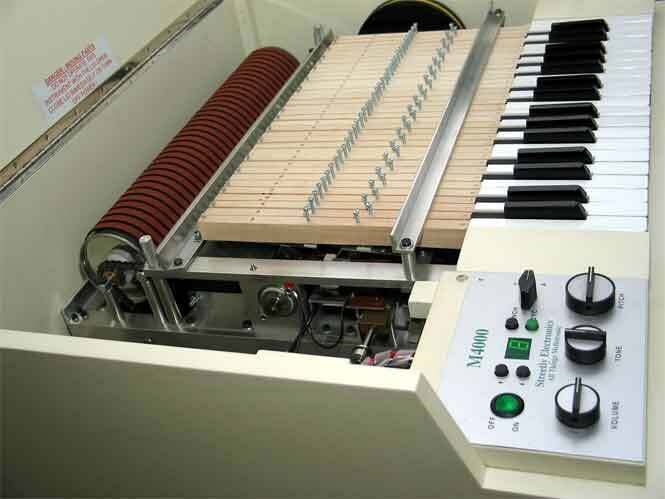 Where every aspect of a piano from the strings, keys, hammers, pedals and even the material of the soundboard is recreated as a digital model. Now IK Multimedia has introduced us to the first ever fully physically modelled electric bass guitar MODOBASS. IK Multimedia’s MODOBASS has taken some of the most sought after bass instruments and have taken them apart literally and digitally. Everything from the type of wood, strings, pickups, electronics, playing positions, even amps have been broken down and modeled to recreate a very playable instrument. Every interaction is modeled and generated in real time. You are the one creating a real performance, your performance and not just triggering and playing back someone else’s. Like a snowflake each note is produced based on your playing style and how you have chosen to set up your MODOBASS. 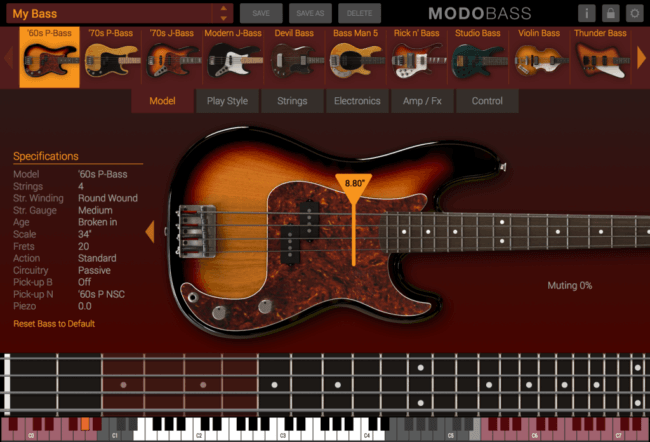 Like entering your favorite sandwich shop MODOBASS gives you all the ingredients to create the perfect bass. Depending on the song you are working on may require a different style of bass so it’s not a one size fits all approach. MODOBASS allows you to have the control to get the exact electric bass sound you are hungry for. Since we are talking about a physically modeled instrument the benefit is smaller size while maintaining performance. Unlike traditional sampled basses which can go into the multi gigabyte territory MODOBASS requires less disc space and computer ram when loaded into your project. This makes things so much easier and worry free especially if you are limited on resources. 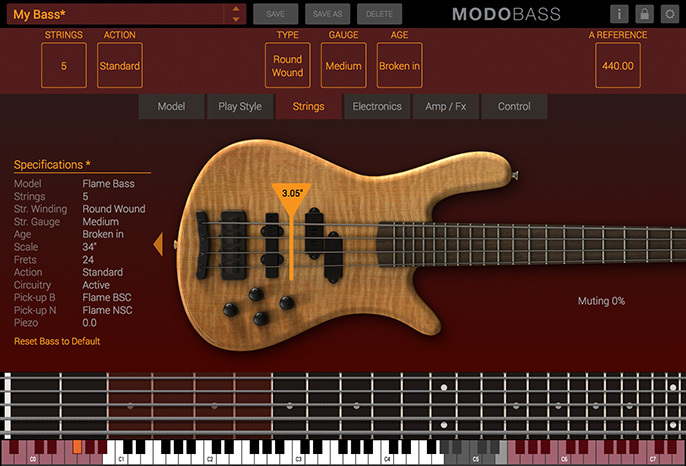 First thing you are going to do is select from the 12 bass models inside MODOBASS. These range from vintage Jazz and Precision basses to the unique Violin bass that a certain Paul was very keen on. These serve as the foundation for your bass. Each one modeled to represent the characteristics of the wood, resonance, sound signature and playing response. So let’s add some meat and toppings. What meat is to sandwiches strings would be to the bass guitar and MODOBASS does not disappoint. You are given control over the number and type of strings you would like to have and even the age and condition of them. A round wound string will present a brighter tone while the flat wound string would be less bright. The age also will have an effect on the overall tone and brightness of the string while the ACTION setting will give you control over how much fret and movement noises are present. Like I said IK Multimedia has gone out of their way to give you all the ingredients you need to create a complete bass experience. 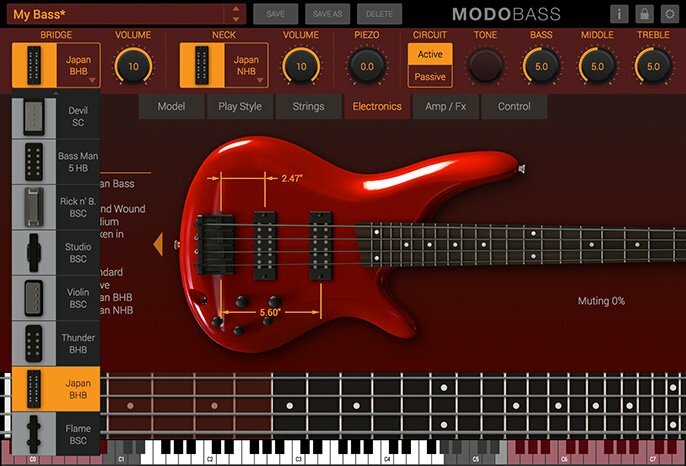 MODOBASS includes an extensive “electronics” section where you have a choice of various pickup styles and passive or active electronics in the bass itself giving you the control to shape your sound. You also have total control over positioning the various elements as everything works together to construct and shape your tone. One of the interesting applications of modeling is that you can take a vintage Jazz bass for instance and load it up with modern pickups and electronics. You can also go the other way and select a more modern bass model and pair it with vintage electronics. Your bass creation is almost complete but we’re not done yet. MODOBASS leverages IK Multimedia’s expertise in creating virtual amps and effects in their Amplitude products and this technology has made its way to be a part of MODOBASS. You are given two detailed bass amp models from classic tube to a modern solid state model, but they did not stop there. MODOBASS also includes a wide array of effect pedals (stomp boxes) that allow you to shape your sound. Everything from doublers, equalizers, choruses, etc. are there to get things seasoned just the way you like it. You are also not limited to using MODOBASS’s built in effects. IK Multimedia has provided an option where you can route the output of MODOBASS to your favorite effects plugins to cover the entire spectrum of possibility from traditional to experimental and beyond. So you have the perfect bass so what next? Well with something this big and meaty it is going to take two hands and IK Multimedia has got you covered. Playing bass is not just a note on, note off affair. To get the most authentic experience you are given control over playing style, legato, slides, bends and much more. In order to make the most of this I recommend using a separate keyboard controller if you do not have a way to accommodate the control keys on your main controller. I have been experimenting with using the iRig Keys mini to assign the various expression controls to just so you can get the most out of playing and performing with MODOBASS. One of the interesting aspects of playing MODOBASS is that you also have control over where your hand and fingers are when you play a particular note. Most bass players don’t just play in the same place. Each time you play a note your hand position may move slightly and this has an effect on the way the bass sounds. It also helps to elevate the jackhammer effect where the same note is being played, at the same velocity and in the same place. This is a dead giveaway that you are listening to a virtual instrument. Having this level of control ensures you are going to be able to have all to tools you need to create a convincing bass part. 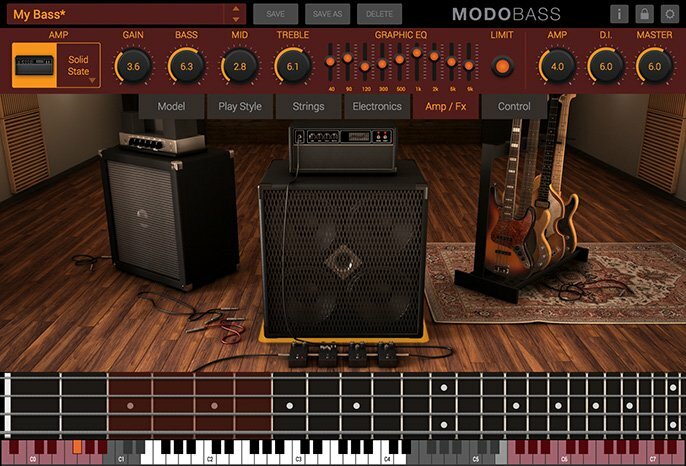 IK Multimedia really has thought of everything in creating MODOBASS. Their attention to detail really shines through as you spend time playing it. Like any other instrument the more you play, the more you will discover and improve. You will also no doubt be surprised as you play MODOBASS to forget that you are not actually playing a real bass instead of a keyboard and you might ask the question, “is it live or is it MODO? 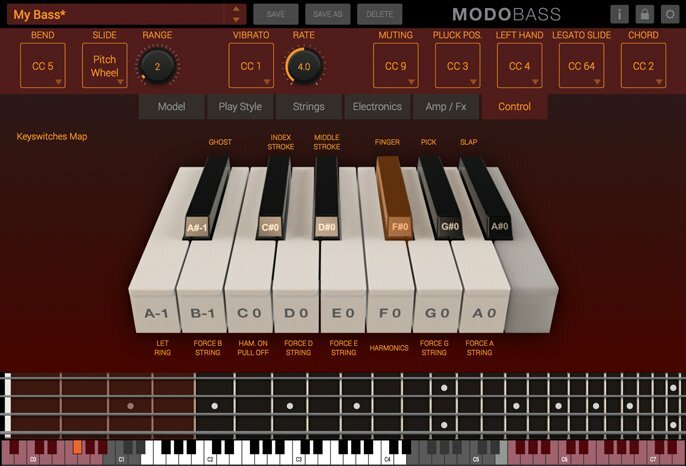 MODOBASS is available. For more information, pricing and to order visit IK Multimedia’s website.